Thinking of replacing my old Dell laptop. Considering going the tablet PC route, specifically latest generation Surface Pro. I use EQMOD, PHD2, AstroTortilla, BackyardNikon, SharpCap, Cartes du Ciel, and Nebulosity, mostly. I use a powered USB hub on the mount already, so that helps with the limitations of a single USB port on the Surface. But I use an external drive to store files, and that does not easily fit with the single-USB scheme. Assuming I can overcome that limitation, are there other issues awaiting me that I haven’t considered? Are there non-Microsoft tablet alternatives that would work as well? I use a refurbished Surface Pro 2 to remote in to my on-mount Intel compute stick. Cost less than 250, windows 10 Pro included, along with 8 GB RAM and 256 GB internal storage. It has a core i5 CPU. It has become my walk around tablet/PC, replacing various iPads and kindles. Light, compact decent keyboard and good battery life. As to issues, at the very edges of the touch screen the screen is somewhat unresponsive, but I understand that this issue has been rectified in later models. The screen on the SP2 is wide screen format, BTW. Why not use the microsd card for storage ? They come in pretty big sizes at reasonable prices. 256GB for $60. Or, a USB hub attached to the USB port ? Edited by nic35, 11 February 2019 - 09:04 AM. The Surface Pro works great for me, but I save my images locally during acquisition, and transfer them to external HD at a later time. I also use a small 3-way splitter at times, which allows for my wireless mouse dongle, connection to ASI294, and 3rd port unused, but you can use your external drive. Appreciate the comments. A colleague has given me a Surface as a temp loaner. So I’ll get a chance to play with it before committing, either way. Are you talking about using the Surface Pro as your mount-side computer? I wouldn't want to leave a nice expensive computer like that outside all night. Now if you wanted to use a small compute stick or NUC as your mount-side computer, and use the Surface Pro for remoting into it, that sounds like a better idea. I agree that having a small computer like a compute stick or NUC is a nice mount-side solution, but I've had no issue using a dedicated laptop outside. I have mine housed in a little laptop pup-tent, and I have it configured to operate with the lid closed. This means the LED screen and keyboard are not lit. I also unplug the mouse. I am running in the backyard through my home's 110V AC. However, if I were to image remotely more often I would prefer to go to a lower power solution like you are suggesting. Just wanted to say here, however, that there are simple and effective ways to use a laptop mount-side without issues from dew, weather, laptop lights, etc. I am considering both alternatives. I already have an Intel Compute Stick configured as a mountside computer. On the few occasions I've used it, it has worked well. However, it requires setting up a WiFi router so that I can control it using Remote Desktop. Plus, I am constantly fighting with MS updates that kill the rdwrapper software needed to use remote desktop with Windows Home version. On most occasions, however, I drag my full size Dell laptop to the mount. With that comes the need for AC power since it is a power-hungry beast that drains 12V batteries before the end of a session. The laptop also has the advantage of a little larger screen for sharing EAA images at outreach events. If I had a Surface Pro, I would probably scrap both the Compute Stick and the Dell laptop in favor of the Surface. I would not expect to need AC for the Surface, and I could still use remote desktop to free me from sitting outside in the cold! I use a Surface Pro 4 to run my entire rig, all night, no matter the temperature. I use a decent case with it, and I pull off the keyboard (which I have killed once due to low temps) and it hums all night long. The computer with a case on it will generate plenty of its own heat to keep itself at a good working temperature. I have had it out in -10C, with zero problems, zero frost, in fact, there was a square radius around the Surface case that was completely frost free, while the remainder of the stool it was propped up on was completely iced and frosted over. Keep in mind that the NFL uses them (without keyboards) in very cold and rugged conditions (Rain, Snow, etc). The important thing to keep in mind with the Surface Pro is that you are limited in terms of its single USB port. If that is of no issue to you (and it isnt for me, I run everything on a USB hub) then the Surface works wonderfully. It also comes with Windows 10 Pro, so you can use Remote Desktop without the need to upgrade from home to Pro. Get a good case (I use this one) and you are good to go. Buy refurbished if you can, you get a pretty great deal on them. If you do decide to buy new, get the Microsoft Complete warranty for it. If it dies and is totally your fault, they will send you a new one. They will do that twice during the period (IIRC, check that) then you have to pay a fee to swap them out past that ($500 or so...). Edited by rockstarbill, 12 February 2019 - 10:42 PM. I've used a (older) laptop outside several times (before going with the Raspberry Pi), and during cold nights, I would come out and there would be frost on the computer, and the screen didn't work all that well. No way I'd want to leave my "good" laptop out there. But hey, if you don't have those issues, and are comfortable doing it, go for it! Edited by Kevin Ross, 13 February 2019 - 01:42 AM. I had a lot of quality problems with mine. Had to replace the keyboard 3 or 4 times when one key or another stopped working. Won't buy another. How long does a 12v battery/tank last with a laptop connected? I also have a Surface Pro (bought last year) that I use scope-side inside a plastic tote, like many others do. The tote keeps the keyboard from being exposed to the sky, which helps to prevent dew/frost. The tote has a hinged lid with gasket, so I can close it up once everything is running. As well, I put in a little 50W heated pad inside, attached to velcro strips, to add some heat and have a warm surface to rest the Surface Pro and my cold hands on. Plus a little motion activated light with red tape over it, to give me some light when I need it. I've been out in near-zero degree F with no problems, no dew or frost, and I've seen no degradation in battery performance on the Surface Pro. For extra protection, in case the tote tumbled over, I have the Surface Pro in a protective case and use a right-angle USB cable adapter to prevent too much torque on the computer's USB-3 connector from the cable (not shown in the picture though). The only thing I noticed is that the cold temps can be rough on cables and strain reliefs, as I'm just noticing the strain relief breaking on my Surface Pro power supply. On my patio, I'm running off 120VAC, but I do have a couple Celestron Powertank Lithium (LiFePo) batteries (one small and one large) that can get me a night's worth of imaging. With so many 12V accessories, I'll likely be switching over to some kind of dedicated 12V power management for both AC and battery as the source. But that brings me to another point about the Surface Pro, compared to traditional laptops; it takes 12VDC already and you can get a cord like this to connect to any of your power management systems (or external batteries) very conveniently. I've admired the computer-on-scope setups that people have put together, as well as things like the PLL Eagle, but I feel like I still want a display, keyboard and mouse right out at the scope, ready to go at all times. As I get more into automation, that might change, but for now I like having the Surface Pro out there. And for visual use with friends/family especially, there is the ExploreStars app that runs well with the Surface Pro wireless (WiFi to the PMC-Eight mount) in 'tablet' mode, using the touch screen to control things. Edited by jrsone, 13 February 2019 - 10:51 AM. Previously, when you used your laptop outside over night, did you leave it out exposed to the elements? And did you leave the laptop open? Did you not understand that this is precisely not what I do? The purpose of the link I provided was to show how to protect your laptop from exposure. Let me re-emphasize that I don't leave my laptop exposed to the elements when I leave it outside next to my equipment. (That is not recommended as you have experienced.) I provided a link to a laptop dome tent that completely encases it. This keeps off the dew and the frost. I can't say whether or not this would be adequate for temperatures under the mid-teens Fahrenheit as this has been my lowest temperature in which I've operated. Again, I have the laptop configured to operate with the lid closed, so the screen and keyboard are not used or openly exposed during the night, even when inside this little tent. 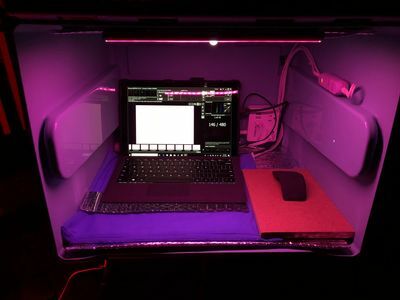 In my experience the heat generated by the laptop, which is partially insulated by the tent, keeps the environment temperature adequately above the dew or frost point, at least under my typical conditions. This is a great solution, similar to what I can achieve with my little dome tent. If I were to image in a colder environment like you, I would also add a heat pad, however I typically don't need that for the Seattle area. My bigger concern is dew, and I can keep it out. I started out with a cardboard box solution, which quickly got so damp that it sagged down and ripped during the night. Next came a contraption that was still exposed in the front, and that didn't work as well because dew could still get in. I finally evolved to entombing the laptop completely and operating with the lid closed. I've had no issues since. Yeah, well, I was a beginner when I did it, so yeah, I left it outside, open, exposed. From there I quickly moved on to having a Raspberry Pi at the scope, and haven't explored laptops at the scope since then. So not only did I do it wrong because I was a beginner, I haven't been motivated to figure out how to do it right since then, since I no longer use a laptop. Feel free to ignore everything I say. OK, Kevin - I understand. I just want to make sure that nothing I am posting here is misconstrued, and you and I have now sufficiently warned all readers not to risk leaving a laptop outside exposed to nature. Take sufficient precautions, all readers of this thread! With my old Dell, a 12V PowerTank (the smaller lead acid version), lasted around 2 hours before the PowerTank started to complain. Never tried it again. I suspect there are ways to get better performance, but I haven't investigated. Thank you! I have the lithium version. I just started the AP journey so I'll see what happens. +1 for the Surface Pro, it's been a workhorse for me on the business side. The micro sd slot works well for extra storage if you need it, and its just so light for the performance you get. It definitely is a laptop first though. Windows 10 is just not nearly as touch friendly as a iPad, if you were interested in the more tablet side of things. And make sure you get enough performance to future proof it, not even a ram upgrade option available. If you do decide to stay with a laptop and upgrade, the HP Omen I use on the personal side is great. Far heavier for sure, but cheaper for more power and red back lit keyboard is quite nice if you find yourself outside. That HP Omen is a very nice system. The i7 version has 6 cores/12 threads, multiple USB3 connectors, with up to 32GB memory, NVMe SSD. You could actually do some PI processing while remote if you have enough electrical power for it. Not cheap, but a lot of processing grunt while on the road. I have a Surface Pro i5, third generation and I like it a lot. I've put a power pole connector on the power adapter cable so it connects to my RigRunner along with all the other 12V stuff, so its universal power. It is powerful enough for data acquisition and limited PI processing to evaluate image quality and get an idea how an image is going to look. All in a slick, elegant package. It took me a bit of time to shut off all of the tablet crap and I only use it in laptop mode. The only downside is the single USB3 connector, but so far a usb 3 hub had made that a non-issue. Edited by Dan Finnerty, 16 February 2019 - 11:52 PM. Can it be charged directly from 12VDC source, or is there a voltage booster involved? What is typical for battery life? But that brings me to another point about the Surface Pro, compared to traditional laptops; it takes 12VDC already and you can get a cord like this to connect to any of your power management systems (or external batteries) very conveniently. So no voltage boosting involved, and the battery life depends on what you're doing, the monitor brightness, which processor you have, etc. I don't have any good statistics on my surface pro, as I usually have it plugged into a power source when imaging, but for general use it seems to be in the neighborhood of 6-8 hours. Edited by jrsone, 17 February 2019 - 10:46 AM. I wouldn't want to leave a nice expensive computer like that outside all night. My field computer is an old laptop running Windows Vista. I put it in an open front box with holes in appropriate places for cables. The box is enough to keep off dew and frost down into the twenties Fahrenheit. Theft isn't a worry since I'm sitting right next to it in my van keeping warm. Unless a person lives in a very bad neighborhood, I expect a back yard would be safe, too.